The 19th century was the age of a truly popular theatre. New theatres were opened to satisfy a growing demand for entertainment from the workers who flooded into the major cities as the Industrial Revolution took hold. In the early years of the 19th century, because of the Licensing Act, plays were allowed to be shown only at two theatres in London; at Drury Lane and Covent Garden. The styles of Melodrama and burlesque were popular at this time, because they had short scenes and a rather lively musical accompaniment. There was a huge growth in demand for theatrical entertainment in the early 19th century that made the patent theatres’ system unworkable, which is why theatres had sprung up across London. In 1843 the Licensing Act was dropped enabling other theatres to present plays. 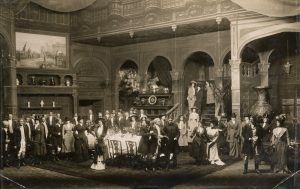 At the turn of the 19th century, the Kemble family dominated the London stage. Actor John Philip Kemble and his sister, Sarah Siddons, were regarded to be two of the finest actors in theatre at that time. Their younger brother Charles Kemble and his daughter Fanny were later stars of the London stage in the 1820s. John Philip Kemble made his debut on the London stage in 1783 as Hamlet. His acting style was static and declamatory and he excelled in tragic Shakespearean roles. The popular actor Edmund Kean replaced Kemble as the darling of the London stage after making his Drury Lane debut as Shylock in The Merchant of Venice in 1814. His natural passion and fiery spirit suited a melodramatic style of acting and he became famous playing Shakespearean roles, particularly as Macbeth, Iago and Richard III. It started out by appealing to a working class audience and became synonymous with spectacle. As a variant of drama, it remained popular until the early 20th century. From the middle of the 19th century the theatre began to take on a new respectability and draw in more middle class audiences. Pictorial drama placed great emphasis on the use of properties, and carefully studied costume detail and reflected a fashionable interest in archaeology and history. This use of historical detail gave the theatre a sense of learned respectability. The sophisticated technology and machinery of the late 19th century stage paved way for a series of ‘sensation’ dramas in which special effects became the principal attraction. One of the greatest designers of such scenes was Bruce ‘Sensation’ Smith of Drury Lane. This theatre, with the introduction of hydraulic stage machinery in 1894, became the acknowledged home of such drama. Because of their heavy reliance upon visual spectacle, many of these dramas provided excellent material for the developing silent cinema. A young new playwright, Tom Robertson had devised a new kind of play which became known as ‘problem play’ because it dealt seriously and sensitively with issues of the day. His work was considered so revolutionary in style and subject that no established management would touch him. The Bancrofts, another influential theatre family, were also responsible for making fashionable the ‘box set’. The drawing-room drama became much loved by the Victorian educated middle classes and the Bancrofts redesigned the theatre to suit their audience. They also encouraged ensemble acting and paid their actors well. They treated their actors with respect and dignity and revolutionalised the world of theatre, lavishing considerable funds on their productions, risking new plays, and because of this in 1885, after only 20 years in management, they retired with a fortune.